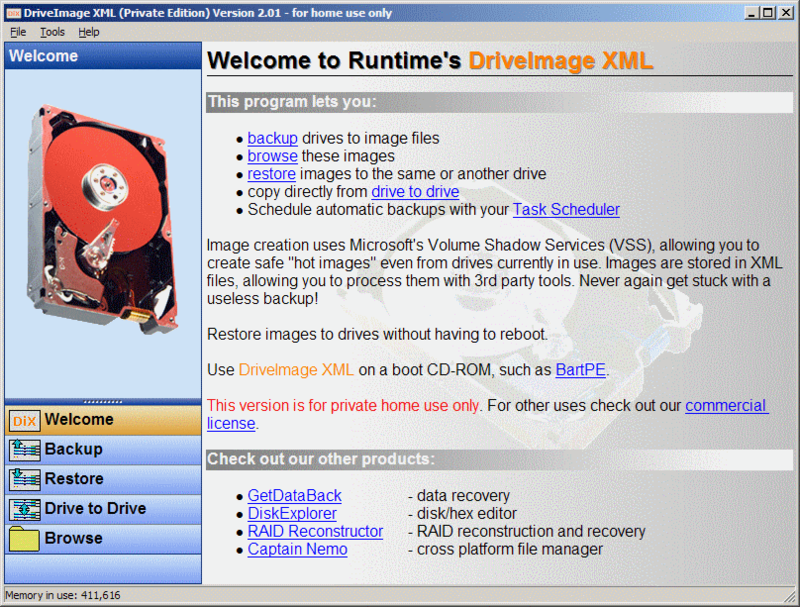 DriveImage XML allows you to backup any logical drive or partition to an image file, even if the drive or partition is currently in use. You can browse an image file, view/extract files from it, or restore the image to the same or different drive. It also has a function to help you clone one hard disk to another. Unicode support: Partial. The program itself doesn't support unicode, but it uses Windows Shadow Copy for backing-up. Download the installer and install to the default folder. Copy all files (except Uninstall.exe, INSTALL.LOG and install.sss) to a folder of your choice. Dave: Many programs that have access to system areas and require admin rights are difficult to effectively virtualize by Sandboxie or other programs. I have my doubts regarding how "portable" this program is. I know it's popular...but portable...not so sure. I decided to try running it in a sandbox (Sandboxie). It wouldn't even install in the sandbox. Makes me think this program is trying to install a driver and sandboxie is stopping it. If so, then it's not portable in my sense of the word. i remember people used to have issues with this program and i think it maybe used to be vaporware but the concept seems cool. if people need an alternative, try Todo BackUp. it's also freeware. Success! I was able to boot Win7 after restoring an image using v2.0.2 on UBCD4win, that was made using v2.1.3. What I had to do was run the bootrec /Rebuildbcd command from the Windows repair console command prompt. Also I had to delete the bootmgr and C:\boot\bcd files from my second hard drive due to past attempts at repairing the startup. Not sure if the old version of DIXml actually caused this now. Could have been that pesky problem between the keyboard and the chair. :) But I got it to boot without restoring another image! The page here says version 2.14, but it is 2.13 at the runtime site. I use Ghost and I have tried all the others including this and I will tell you all that Ghost is by far the best at backing up partitions and whole drives, I have been using Ghost for over ten years and NEVER had a problem. this web site says only xp & vista. When making it portable, does that prevent it from working on win 7 or is this web site just not up to date? included vista repair tool fixed my ghost8 clone attempt on a vista machine. saved me having to use vista restore DVD. this is going into my collection. *** WARNING *** Do NOT put this on 2000! It will wipe the keyboard, hose the mouse, prevent My Computer from coming up, and disable "Add/Remove Programs" -- basically, if you want to really hose someone, go ahead. Can I restore my C: drive using this, or do I need to have Windows up and running first in order to run it off the thumb drive? It seems to me that for backing up my entire OS, I would need to use the BartPE disk...right? Essential tool in my Disaster Recovery arsenal. Completely reliable, not sure why Banshee had problems but I've used this for three years across Windows XP > Vista > Server 2003 > Server 2008.
recovery via UBCD, or Bart as others suggest. There was a small but important misprint in the blog post I referenced above: they've since removed the words "and vice-versa". The only worry then is to make sure you update all copies of the software that you might have lying around (especially on BartPE disks). Beware that backups made with the current version (1.30) cannot be restored with earlier releases, and vice-versa. The company did not include that information on the website, in the installer, or anywhere in the program itself - only on their blog. The download link only points to the most recent version, so if you have an earlier backup but somehow lost the program, you'll have to search for for a pre-1.30 version on the web. I have to say I have nothing but problems with this program, either backups dont start, clone operations simply fail with a cannot start job failure. Very dissapointing, I use snapshot instead (not freeware but worth every penny). Very fast, portable and runs from a dos command prompt as well as a windows gui. Is it a freeware as it is stated? What are the restrictions with the unlicensed freeware? been using this at work in conjunction with BartPE to rapid-deploy tens of desktop PCs. works like a charm. Very handy tool. After booting from a PE Windows on my USB stick I use DriveImage XML to restore OS partition data from external USB harddisk. Restore-speed is excellent but may take some time for backing up partitions with many (ten or hundred of thousands) small files. In this case TrueImage is the way to go. This looks EXTREMELY intriguing. I currently use Acronis True Image Home 10 at home, but this may come in handy for some portable and remote installations I manage.